I have been a woodturner for over 20 years and during this time it has been more of a passion than a hobby. About six years ago, I began to embellish my pieces with surface texture and then the adventure began. for many of my pieces is often a marine creature, although the forms are clearly not realistic and the carved decoration might come from a number of different sources. My preferred material is sycamore (Acer pseudoplatanus) or cherry (Prunus spa.) turned into a hollow form. The pieces are often left thick so that there is sufficient material for the texturing. It is important that the hollow form is turned well both inside and out and that the shape is pleasing. There is little point in spending hours decorating a piece if the initial form is poor. The time spent on the lathe is relatively short compared with the time taken to decorate the piece. Away from the lathe, the texturing and shaping is done with a variety of tools but primarily I use a micro-motor and fine burrs. The bulk of the wood is removed using a pendant motor and rasps. Some of the pieces are textured using pyrography and often the sycamore is bleached. In order to produce some of the textures, I have to use three or four layers of different carving to achieve the desired effect. This piece is a hollow form made in cherry. The vessel has been opened by longitudinal slits and piercing. 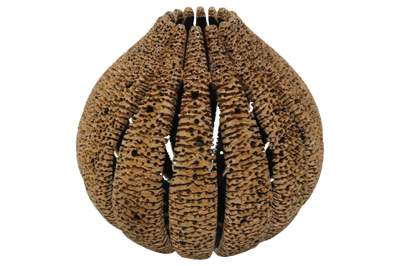 The idea for the surface texture came from a piece of coral and was made using small burrs. The fingers around the mouth of the vessel were shaped, textured and pyrographed.